In 1935, on the occasion of the 25th anniversary of the founding of the Society, two types of awards were established: “Medal of Jovan Cvijic” and “Memorial Plaque of Serbian Geographical Society.” So far, 51 scientific workers and 14 scientific institutions received “Medal of Jovan Cvijic”, the most important public recognition of the Society. Memorial plaque of the Society, has so far received 132 individuals and 14 of the constitution and subsidiaries. Since 1995, the Society introduced another 4 awards: The Charter of the Society’s Articles of honor, the Charter, Acknowledgement and Special diploma. 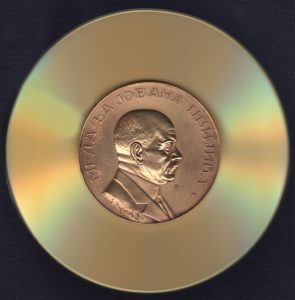 Medals and other prizes are awarded at a gala given Jubilee at the annual meeting of the Society.